After R&M (Randy and Michelle) took the time to carve our super cute Disneyland Matterhorn Bobsled Pinewood Derby seen here, a thank you was definitely in order. We created this cute Star Thank You Card with scraps we had from other projects. Used a 7" x 5" piece of white cardstock. Folded it in half and the two bottom corners with my Creative Memories Corner Rounder like the one seen here. Love the soft look this effect creates. Then cut a 4 3/4" x 3/4" piece of printed paper and cut one of the long edges with Fiskars pinking paper edgers like these . Glued it to the to portion of my card, about 1/8" in from the edge, with pinked edges to the top. Then cut a 4 3/4" x 2 3/4" of printed paper in a different pattern, and rounded two of the corners. Glued this on the bottom half of my card, overlapping the top printed paper. Then, with my Cricut Expression like the one shown here (which by the way is an excellent deal! ), I cut a star out of dark colored cardstock, followed by a star about 1/4" smaller in a lighter colored cardstock. Glued them together and then onto the card. 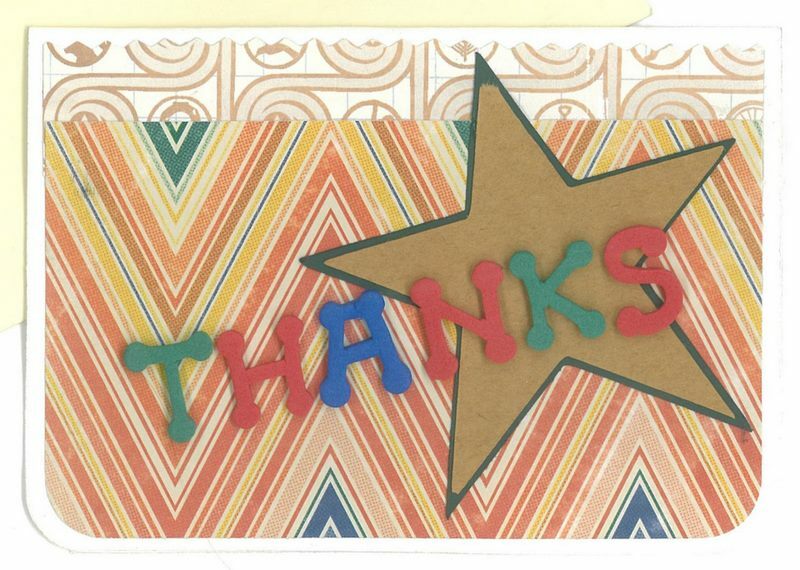 We finished with a THANKS with foam letter stickers and we're done. I made about 12 of these to have on hand and ready when an occasion arises. Then I can just pull from my pile at a moments notice.